The Feminine Mystique Art Gallery represents over 85 female artists. 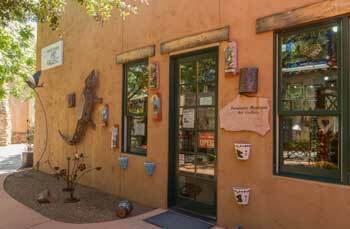 The gallery has pottery, glass, wood, watercolor, acrylic, oils, as well as cards and jewelry. The Feminine Mystique carries some of the best contemporary and original art around. In season the gallery is open 7 days a week, 10 AM to 5 PM. Gallery hours: 10am - 5pm every day. Come see us and be greeted by friendly sales people. We are located in the La Entrada Plaza area on the frontage road. 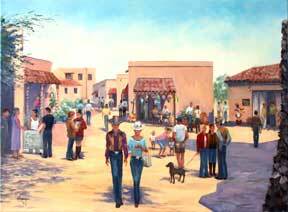 Come see our wonderful gallerys, eateries, and shops. La Estrada is a park like setting with shade trees and sidewalks, wheel chair friendly. The Feminine Mystique Art Gallery is part of the center patio area which offers Manos Gallery, Niche, Cuitaca and Tumacookery Kitchen, as well as the Feminine Mystique. 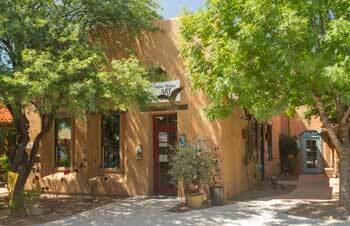 Enjoy La Entrada's Tubac Deli, Elvira's, Wisdom's Dos! and the convenient public rest rooms. We look forward to your visit in person 10 AM to 5 PM 7 days a week, in season. The images below are 360 degree views of the interior and exterior of the gallery. Just "click and drag" on the image to move it left or right. My life has always had close ties to women's rights and equality. The Feminine Mystique Art Gallery, with great respect to Ms. Betty Friedan, is another extension of me. Women are amazing human beings. Our best attributes are multitasking and the ability to nurture. (A great practice for compassion and patience). Being in a room of women can be very self assuring. There is an energy that passes from one to another, very nurturing. Signup for the Feminine Mystique Art Gallery (mostly) Monthy Newsletter. This newsletter will be delivered via email on a semi regular basis and contain news and information about Featured Artists, Events and Workshops offered at the Feminine Mystique Art Gallery. Your privacy is important to us, you may submit your email address with confidence, we will never sell, rent, loan or give out your address to any party. It will be used only for providing you with Feminine Mystique Art Gallery information. We will treat your personal infomation as if it were our own. Also, included in each newsletter you will find an unsubscribe link to opt-out at any time.